← Yes We Can Can! It’s a Hot One! That calls for a Hot Pizza?! Eggplant is just coming into season in certain parts of the country. In fact after a long wait, and a lot of lovingly hot weather, my eggplants on my rooftop deck are finally growing! You can find eggplant near you by entering “eggplant” in the search box on the front page of Real Time Farms (you can find at many places in and around Ann Arbor). 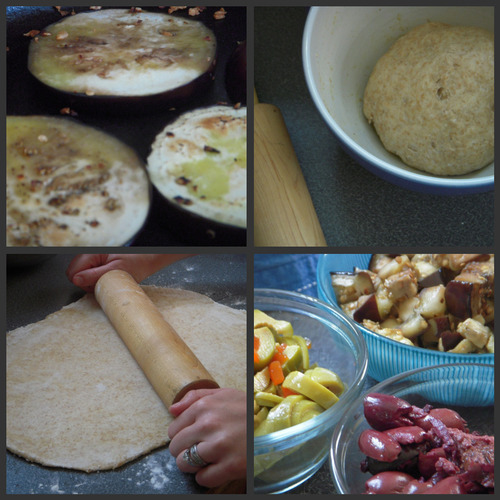 We decided to go the full monty and make the dough from scratch as well. I had never made pizza dough before, so Lindsay demonstrated how. I thought it might demand a certain amount of rocket science, but to my surprise it was actually immensely simple (the yeast does all the work for you!). Just remember to plan ahead, because the dough has to rise for 1-2 hours. 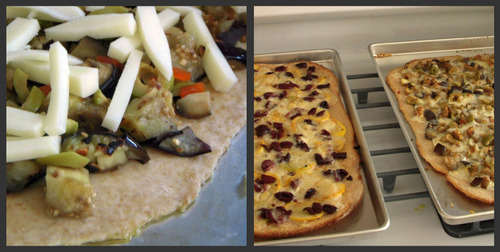 We figured, in order to feed our always voracious team, we should make 2 pizzas: one with eggplant and green olives and another as a spin off of the recipe with squash (given to us graciously by Blue Dog Greens) and kalamata olives. They were both delish (not a real word…but should be)! 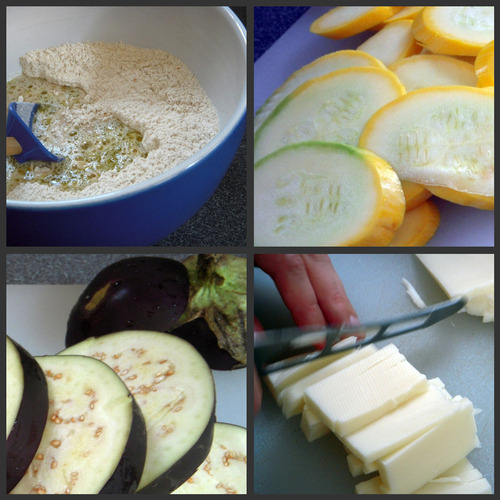 I did learn as a hint that when cooking the summer squash and eggplant in the olive oil and garlic mixture, that it helps to add the garlic towards the end, so it doesn’t burn. But don’t skimp on the garlic when it comes time to add it, because it gives the pizza a sweet, onion like flavor you wouldn’t want to miss! This entry was posted in In the Kitchen (recipes & more) and tagged cara rosaen, eggplant, farmers markets, Real Time Farms, summer squash. Bookmark the permalink.